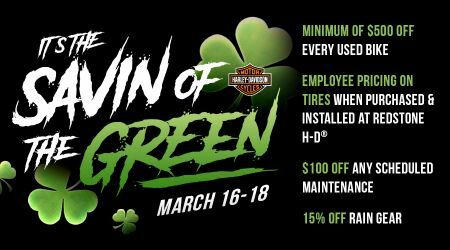 Home › Promotions › Savin' of the Green! What better way to celebrate St. Patty's than some saving of some money in your pocket! MINIMUM of $500 off every USED BIKE. We even have EMPLOYEE PRICING ON TIRES when purchased & installed! If that is not enough.. we have $100 off ANY scheduled maintenance and 15% OFF rain gear to keep ya ready and prepared for the road! Come see us!